Mott The Hoople live were an often shambolic, ragged outfit, but therein lay their down-home appeal. They were no masters of their instruments, no Jimmy Page, Keith Moon, Keith Richards or Jimi Hendrix. They were simply an honest, hard-working, had-rocking band who gave an energetic, bombastic, often chaotic live show. This is perfectly captured on this rough and ready release. 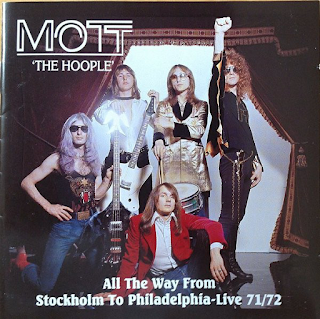 The first six tracks are from 1971, before their David Bowie-inspired renaissance and were recorded in Stockholm for Swedish radio. The sound, considering from when it dates, is ok, but don't expect any "audiophile" quality. Both the concerts included here are "warts 'n' all", sound-wise - a bit distorted at times, a bit crackly, a bit muffled. They are live recordings in the purest sense of the word. They sound like it probably sounded like being there. Highlights are a rocking "Walking With A Mountain" and Ian Hunter doing his best Dylanesque thing on Sonny Bono's "Laugh At Me" and a rousing closer in "Keep A-Knocking". The second gig is from a show in Philadelphia in 1972. The band are introduced onto the stage by David Bowie, who later joins them to encore "All The Young Dudes". The sound is not as clear as on the Swedish gig, but it has a huge bassy thump to it. Just turn it up loud and enjoy it, despite its sonic shortcomings. 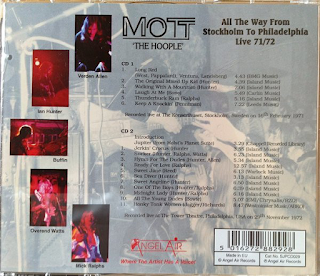 This is Mott The Hoople at their improvisional, raggedy live best. "Jerkin' Crocus" is a great Stonesy opener and Lou Reed's "Sweet Jane" is another superb riffy one. The ballads "Hymn For The Dudes" and "Sea Diver" are other highlights, but Mick Ralphs' "Ready For Love/After Lights" simply goes on too long. For some reason, seventies rock groups always thought it was ok, about four songs in, after a rocking beginning to the gig, to indulge in twelve minutes of solo guitar doodling that killed the atmosphere somewhat. They all did it. As I said, just turn this up and enjoy it for what it is - one of the seventies' best loved rock bands giving it their all.